Nevill Avenue, Hove under construction. In December 2017, I volunteered to help Kevin Wilsher and Mary McKean at the Regency Society in their project to update James Gray’s Brighton and Hove Photographic Collection on the Society’s website, with present-day shots taken from the same position to be set alongside the originals. One of the first photos I was given by Kevin was this one (JG-17-048) that James Gray himself was in doubt about in terms of location. 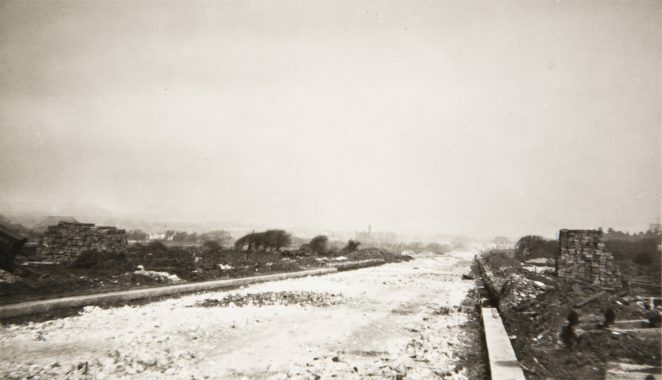 He had been told it was taken in Nevill Avenue, Hove in 1933, but the Greyhound Stadium was nowhere to be seen, even though it had opened in 1928. Looking at it myself, I felt that the tower in the photo was not far enough over to the left to be the Goldstone Pumping Station (now the British Engineerium). I went to Nevill Avenue and could see immediately that, looking east in the direction of the Greyhound Stadium, the distant pair of semi-detached houses in the old photo were in the wrong place to be 29 and 31 Nevill Road, on the corner of Orchard Road. They were too far south of the junction with Nevill Avenue. No other houses matched the pair in the photo, which had arched porches, distinctive gables above the first-floor bay windows, a shared central chimney set, unusually, in the front slope of the roof, and side chimneys. So James Gray was right to have had his doubts about the photo all those years ago. I asked Kevin for a higher resolution photo, and decided to look on Google Streetview to see if I could find a pair of semis nearby which might fit the bill. It occurred to me that the photo might have been flipped over to mirror image, and a pair of houses in Cranmer Avenue seemed a possibility, but a look at the actual houses led me to discount them straightaway. I also needed to find another suitable tower, and unfortunately came up with several candidates. There were chimneys at the Ice Factory in Portland Road, at Chapman’s Laundry in Arthur Street, and the Dust Destructor in Leighton Road. The problem was, none of them looked like the one in the old photo. In the first week of February 2018, I emailed Kevin to say that I would not be able to spend any more time looking for the elusive houses – but I soon realised I could not let it go! In Part II, the true location of the 1933 photo, and how I discovered it. Could it be looking at Nevill Road from Orchard Road? No Peter, it’s not Nevill Road, but I had the same thought as you at one point. Regards, Alan. Hi Alan, I suspect that this is actually the road off Holmes Avenue that leads in to the school below Blatchington Mill. Not sure what it’s called now or if it still exists as a school. The entrance is almost opposite Fallowfield Crescent. Very flat and straight with no hills in the background, could it be a different area?